On April 2, 2015, the State Council Legislative Affairs Office (“SCLAO”) published a draft of the Service Invention Regulations along with an accompanying explanation. The draft was prepared with the assistance of SIPO and the Ministry of Science and Technology. Comments are due by May 2, 2015. The draft fully respect the autonomy of the parties, and adopts the principle of priority of the agreement on the rights of ownership and incentive remuneration reached by the parties according to law. At the same time, in order to prevent a disguised deprivation or restriction of the rights of the inventor by the employer, the draft establishes a certain restriction on the principle of priority of the agreement of the parties. The draft provides that whenever there is nullification of the inventor’s rights under these regulations, or when the enjoyment or exercise of these rights is subject to unreasonable contractual provisions or rules, those conditions are invalid. I am sorry to report that Prof. Guo Shoukang 郭寿康, the UNESCO Professor of Copyright Law, emeritus, at Renmin University, died Monday March 22 at 12:35 PM. Prof. Guo was in his late 80’s. 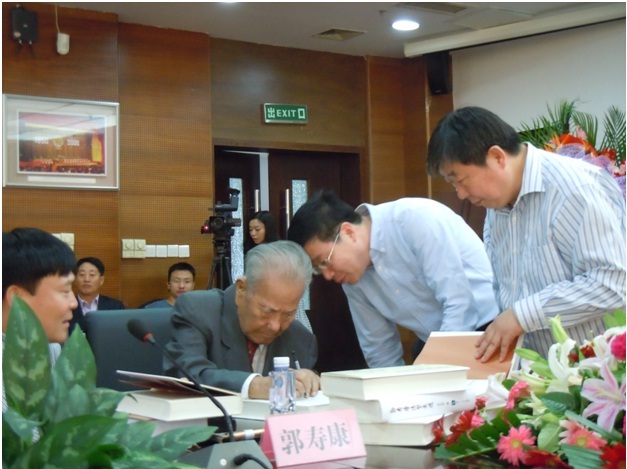 Prof. Guo taught and inspired generations of Chinese law students and officials. I was privileged to attend the 65th anniversary of his teaching law in the fall of 2013. At that time, I was told of how he advocated for a patent law for China in the early 1980’s at the National People’s Congress, when many members were opposed. I was also told that many officials, such as former SIPO Commissioner Tian Lipu, considered him their teacher. Moreover, his record of teaching law streteched back to the late 1940’s, when he was a young teacher at Peking University. I was honored to join him in an interview on CCTV on globalization in IP. If you go to 5:20 on this video, you will find Prof. Guo continuing his role as a passionate advocate for intellectual property, and countering the arguments advanced by CCTV that intellectual property is a barrier to the development of science and technology. Even in his mid and late 80’s he was always active and contributing. I have a copy of his translation of Mihaly FIcsor’s book on Law of Copyright and the Internet which he prepared in 2009 (1125 pp.). He also continued to advise graduate students even in his later years. On a personal level, I enjoyed the pleasure of Prof. Guo at a Passover seder at my house in 2007 when I was a diplomat based in Beijing. I can’t imagine anyone more intellectually curious. Guo Shoukang – scholar, gentleman, mentor and friend. Rest in peace. The “US-China IP Cooperation Dialogue Report” was released last week. The Report was prepared by experts from both the US and China, including co-chairs Professor Liu Chuntian of Renmin University and Joseph Papovich, former Assistant US Trade Representative. I was an also a member of the expert committee, first as an academic with Fordham Law School, and later as an advisor when I returned to USPTO, in an otherwise private sector initiative. Civil Enforcement: the Report urges greater use of precedents through a guiding case system, experimenting with amicus briefs for important cases, expanding evidence preservation and preliminary injunctions, and greater civil deterrence in damage awards. Criminal Enforcement: the Report calls for adjustments to the criminal enforcement system and an expanded and stable role for criminal IP enforcement. The US experts sought greater clarity over “for profit” requirements in criminal IP convictions, while the Chinese side believed that current judicial practice will ultimate reduce these difficulties. Both sides agreed that criminal enforcement should be directed towards repeat offenders, large scale criminal activity, and cross-border criminals. In addition, officials should be encouraged to increase the volume of criminal prosecutions. Authorities should also consider plea bargaining and proportional criminal fines, as well as criminal settlement and victim-offender reconciliation. Victims’ compensation (fudai) claims should also be allowed. Specialized IP enforcement teams and specialized prosecutors were suggested, as well as clearer IP criminal investigation guidelines. Customs: Greater support of Chinese customs, with more resources, and more engagement with foreign countries. Copyrights: The experts supports the 2012 Supreme Peoples Court Judicial Interpretation on intermediary liability and commended the court’s openness in accepting outside comments and evaluating foreign practices. Both sides also encouraged foreign companies to more aggressively use legal remedies to stop infringement. While China has made significant improvements in end user piracy, the necessity of criminal liability was also underscored. The experts also believed that live sports programming should be protected under China’s copyright law, and expanded protection should be afforded to technological protection measures. Trademarks: The experts expressed support for SAIC’s efforts to address online sales of counterfeit goods, and urged the SPC to consider leveraging its experience in dealing with secondary liability in the copyright context to the trademark context, in order to encourage more cooperation between platform owners and brand owners. The experts also urged the CTMO to adhere to the principle of good faith TM registrations to deal with squatting, and to expand cooperation with express mail services to deal with global counterfeiting organizations. Patents: The experts agreed that the courts should continue to play a central role in adjudicating patent cases. The experts also suggested that China should consider centralized jurisdiction over patent cases to ensure specialization and predictability. If a centralized patent court cannot be established, the experts considered that the SPC might wish to reduce the number of courts that hear patent litigation cases from the current 89. The experts also expressed their concern about the low rate of injunctive relief for invention patent cases, and consider means of improving evidence collection, particularly in process patent cases. The experts also discussed Article 26.3 of the Patent Law (enablement), and problems with retroactive application of examination guidelines and restricting data supplementation. In evaluating appeals from the PRB to the Beijing courts, some experts also pointed to low reversal rates by the courts, and too much involvement by PRB officials in the court’s decision making process, which can impair impartiality. The experts also recommended a study on the impact of the short statute of limitations (two years) in China on protection of patent rights. The Chinese side also thought that foreigners also need better protection and planning for litigation in China. Trade Secrets: The experts agreed that theft of trade secrets, whether the victims are foreign or Chinese, is “not tolerable.” The experts further noted that trade secret theft “harms business value and destroys trust” and that trade secret cases can have a big impact on “sustaining the growth of R&D facilities and technological collaboration in China.” The experts pointed out that parties in trade secret disputes need to be given a fair opportunity to discover key facts and to examine evidence. Police officers should be able to conduct undercover investigations (Criminal Procedure Law, Art. 51). Chinese experts also cautioned that criminal prosecutions may be abused and that in some cases the civil and criminal results of the same trade secret cases have had conflicting results. This eight page bilingual Report is a very useful read for policy makers in the United States and China. What is perhaps even more important is that it was a joint collaborative effort, which showcases the potential for future cooperation on IP policy efforts. I was privileged to be invited to the celebration of Prof. Guo Shoukang’s 65th year of teaching law on Sunday September 15, 2013. Prof. Guo has had a remarkable career in Chinese intellectual property, civil law and Chinese intellectual history. The celebration was also a book warming for Guo Shoukang Selection of Legal Writings (郭寿康法学文选 Intellectual Property Press, 923 pp). Now in his 87th year, Prof. Guo remains extremely active and alert. He continues to advise students. In addition, he serves as a member of the experts committee on China’s copyright law reform, is preparing an oral history of his work, and continues to translate foreign IP scholarship into Chinese. Prof. Guo has always been a leading proponent of both intellectual property and rule of law. One speaker at this event praised his singlehanded defense of the enactment of a patent law in the early 1980’s as a key component of China’s need to develop its science and technology and opening to the West. This effort was made over an extended period of time, at a time when China’s opening up policies were still unstable. SIPO Commisioner Tian Lipu, who could not attend personally, also praised Professor Guo’s key role in educating him and other Chinese officials on the once-new field of intellectual property. Dean Liu Chuntian of Renmin University’s IP faculty noted there are few individuals in China that can claim to span the time frame in law and intellectual life from China’s Republican period to the current time. Dean Liu described how Prof. Guo lived across a courtyard from Hu Shi, one of China’s leading intellectuals of the 20th century and a proponent of China’s literary revolution of May 4, 1919. Prof. Guo knew Hu Shi while he was teaching commercial law at Peking University in the late 1940’s, which was 65 years ago. Among the many programs that I did with Prof. Guo, two stand out in my mind: one was an interview we did together on CCTV’s Dialogue in 2009 on IP Protection in a Globalized World. At age 85, Prof. Guo was a fierce advocate of the importance of IP and challenged the interviewer for not believing in China’s own capacity to innovate and its need to protect its own inventions. On a more personal note, in 2007, I had invited Prof. Guo to my house to celebrate Passover with my family. I believe no other Chinese friend was as inquisitive and appreciative of that event, which we talked about for years after. In the introduction to Prof. Guo’s new book, Prof. Joseph Straus of the Max Planck Institute, described Prof. Guo as “doubtless the most respected and best known expert in intellectual property of his country. This is clearly evidenced by his numerous offices and recognitions at a national as well as international level. …No wonder that he has a worldwide fan community, including myself.” I am also privileged to be among the fan club of Prof. Guo Shoukang. Long life! 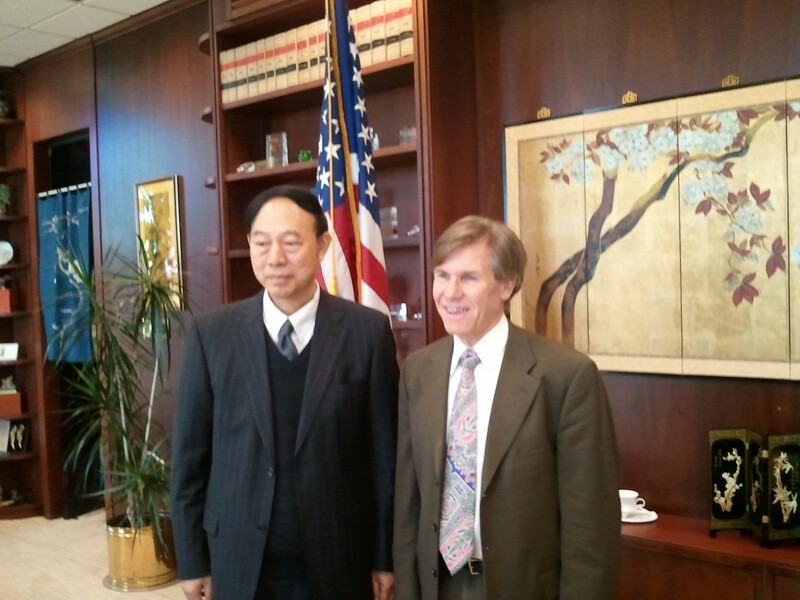 Chief Judge Rader with Renmin U Prof Liu Chuntian.